Dust Mite Allergy and Treatment Options | Allergychoices, Inc. 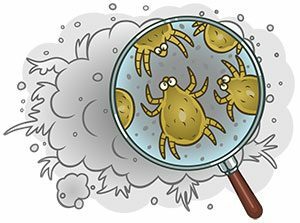 Some environmental allergies are due to microscopic, creepy, crawling, eight-legged creatures — dust mites. These little bugs live in the more humid areas of the home like the bedroom and living room. They don’t bite, but when their disintegrated bodies and waste are breathed in, many people experience allergic reactions. While dust mites thrive year round, allergy symptoms tend to be worse in the fall months once homes are closed for the colder months. Can allergy drops help dust mite allergy? While controlling the amount of dust mites can help symptoms temporarily, there is no way to rid your home of dust mites completely. Instead, those allergic to dust mites can treat the cause of the allergy with sublingual immunotherapy, which helps to build tolerance to the allergen.